Merely steps from St. Charles Avenue, this cottage will become your ideal home base for a quiet weekend stay or an all-out Big Easy experience. Immerse yourself in the ancient cultures that have merged here to create memories you will remember for years. 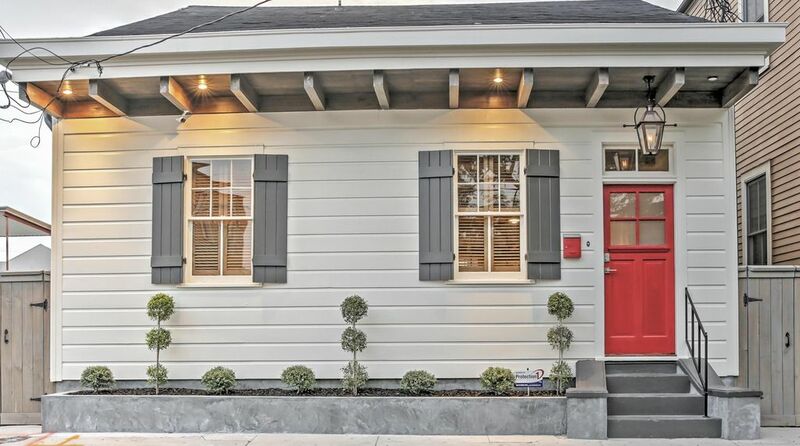 And to that end you'll find the perfect fusion of southern charm and comfort in this newly-restored 2-bedroom, 2-bath 1936 New Orleans vacation rental house, which sleeps four. Licensed with the City of New Orleans: 18STR-09943. Step through the cherry red front door to discover a charming blend of antique and modern styles, featuring original hardwood floors, massive barn doors, exposed beam ceilings, gorgeous reclaimed wood accents, and salvaged doors and shutters. Comprised of 1,300 square feet of beautifully renovated living space, this stylish unit is an excellent match for a couple, family, or group of close friends who are looking to experience the endless excitement of New Orleans. You'll never want to leave with all the amazing amenities provided here, such as stackable in-unit laundry machines, a security system, and wireless internet access. When you're not out celebrating the fast-paced and lively New Orleans culture, curl up on the sofa to take advantage of the 2 flat-screen TVs with Amazon Prime and Netflix. Fire up the charcoal grill in the private fenced-in backyard, to dine al fresco with your loved ones on the cheerful blue deck. When you're ready to call it a night, cap your evening off with a relaxing bubble bath in the ensuite soaking tub before drifting off to sleep. Perhaps the best feature of this stylish property is its phenomenal location, placing you within reach of all the best that The Big Easy has to offer! From here, you'll be 1.5 blocks from St. Charles Avenue and the Lower Garden District, which boasts a plethora of world-class dining, shopping, and entertainment options along the picturesque mansion-lined streets. There are plenty of great restaurants all within walking distance of the home! Be sure to catch a ride on the famous New Orleans Streetcar from St. Charles Avenue downriver to explore The French Quarter and Canal Street only 1.3 miles away. Less than 5 blocks away, you'll discover specialty boutiques, quaint antique shops, and interesting galleries along Magazine Street. When you want to escape the neon signs and glitz of Bourbon Street, take a stroll to the nearby Frenchmen Street, located 2.3 miles from the house, to dance the night away to a wide variety of live music. The enchanting city of New Orleans not only has an astoundingly rich history, but also holds countless exciting events year-round, and this property puts you in a fantastic position to experience it all! You can attend various festivals at the Fair Grounds Race Course 3.6 miles away, catch a Pelicans game at the Smoothie King Center or cheer on the Saints at the Mercedes-Benz Superdome 1 mile from the unit. Take a trip through time at the National WWII Museum only a 15-minute walk from the property. Additionally, you'll find both the Audubon Zoo and Audubon Aquarium of the Americas are both located within a 15-minute drive. Regardless of how you choose to spend your time, this fantastic unit provides the ultimate New Orleans vacation! During your stay, your designated Guest Contact will be available 24/7 to help with any issues that may arise and will provide concierge services for your visit. - Amenities include a fully equipped kitchen, wine fridge, Keurig, 2 flat-screen TVs with Amazon Prime and Netflix, private furnished deck with charcoal grill, 2 adult cruiser bicycles with basket and locks, stackable in-unit laundry machines, security system, Pack 'n Play, ensuite master bathroom with soaking tub, salon quality bath products and much more. Parking available directly in front of the house on the street. No permit is needed. Paper towels and plastic ware provided. Some spices. Ride at your own risk. Owners not responsible for injury, theft, or any property damage resulting from the use of bicycles. We offer concierge services to our guests in advance of and during their stay (booking tours, etc.). The concierge is available 24/7 to help with any issues that may arise. The house was beautiful with all the amenities you could want. The property manager was also great, very responsive and kind. We didn't like the neighborhood all that much, but that has nothing to do with the house. It was really close to the trolly and some good restaurants, making it a really convenient place. We would absolutely stay here again. This property was excellent! The photos did not do the size of the property justice. The home was very spacious. We felt very safe staying there & the alarm stystem was very easy to use. Instructions for everything was easy & planned out well. They had an ample amount of everything. The 24/7 concierge, Ashley was my bestfriend. She assisted us with all of our needs from how to watch the Superbowl when the digital satellite was messing up to coming in to decorate & supply everything for my sister's 30th birthday. I would definately stay here again! So far... our favorite place that we’ve stayed on our annual Jazz Fest visits! You can tell the hosts have put a great deal of time and thought into this property. It was very well laid out... comfortable furnishings, cozy beds, cold A.C... And... a pair of cruiser bicycles that we used to hit the local restaurants and The French Quarter! Nicely done! Our group of two couples really enjoyed our stay in this lovely, newly renovated property. The management group made check-in easy. We loved having the bicycles available. The bedrooms and bathrooms were comfortable and well appointed. The neighborhood is quite, with easy on street parking, an easy two block walk to the St. Charles streetcar and we felt completely safe. We loved the cottage decor and location. Very comfortable. Everything we needed was provided. Check in was simple. I would definitely recommend this rental. Lovely home in an up and coming neighborhood. Cozy quarters beautifully decorated, close to everything we wanted to see. Loved it.